How can I mass print records and attachments? 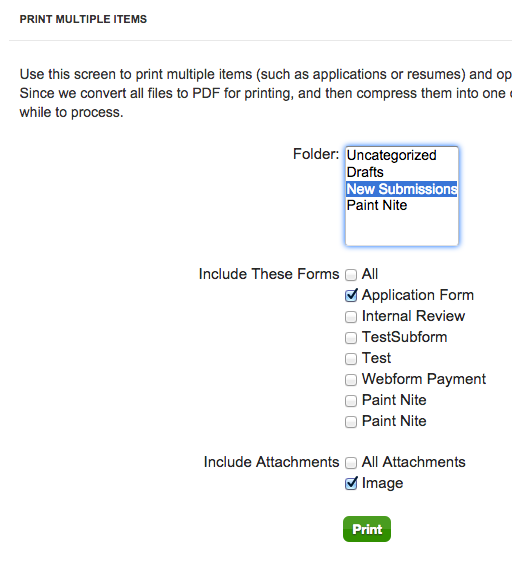 WizeHive Select gives you the ability to print multiple application forms and all corresponding a attachments. You may want to do this to provide reviewers with copies of all the applications in a given folder or print out copies for various reviewers. In this article we will examine how to complete this goal. Please see our full article on the Actions Tab for more information. Go to the Actions tab of your workspace and select Print Multiple Items from the left-hand drop-down. Select the folder(s), form(s), and attachment(s) that you wish to be included in your print job. Click Print. Your selected print job should now appear in Pending Print Jobs and be labeled as Processing. You will receive an email when the print job is ready. The email will not contain your files. Rather, you should return to the Actions tab or the Files tab of your workspace to locate the zip files that contain your requested print job. If you are experiencing difficulty, please read more about Print Jobs or go here if you are waiting more than an hour for your print job or seeing an error message. Why am I experiencing printing issues?